Digibox 87 HP is a very small loudspeaker that employs a Visaton SL87 FE fullrange driver. Digibox 87 HP has been developed by Bernd Timmermanns. The crossover consists of two RCL filters in series, one serial RCL and a 2nd order high pass filter (12dB per octave slope). 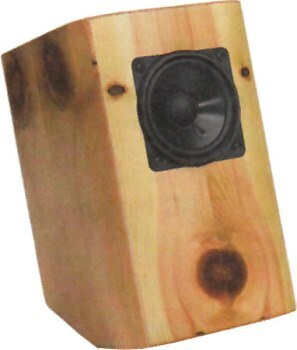 Between 300 Hz and 6 kHz, the frequency response of this loudspeaker is linear on axis. The decay spectrum is nearly perfect. At low volume, i.e. 90 dB at 1 m, the nonlinear distortions are below 1% above 400 Hz. We deliver Digibox 87 HP with different cut-off frequencies to adopt it to a subwoofer. If you don't want to use a subwoofer, we recommend the the DIY kit Digibox 87 without high-pass filter. The high-end kit comes with two polypropylen capacitors (MKP) and two baked varnish coils in the serial RCL. The current flow through the coil creates a magnetic field which sets the reel of wire in motion. This motion induces a voltage in the coil which adds itself to the signal. The stiffer the reel of wire is, the less the signal will be altered.